WASHINGTON : The Chicago Mayor Rahm Emanuel announced expansion of Blue cart recycling services in March and April this year to cover more households in Chicago city. According to him, as many as 131,000 households will start receiving blue cart recycling services in a couple of months. The expansion plans are part of the efforts to expand the recycling services to every community by the year 2013 to make Chicago a more eco-friendly and much greener city. Currently, 260,000 households in the city receive blue cart recycling service. The estimated annual investment for city wide recycling operations is around $19.2 million. Each of the six city service areas will undergo a gradual expansion of households receiving new recycling services. The blue cart recycling program provides bi-weekly recycling collection services to residents living in single family homes, two-, three- and four-flat buildings. Each blue cart can hold 60 kg of material. The blue cart collects clean recyclables such as paper and cardboard plastic jugs, bottles and food containers metal food cans and foil glass bottles and jars The blue cart residential recycling program collects all the recyclables together and transports them to a recycling sorting facility. 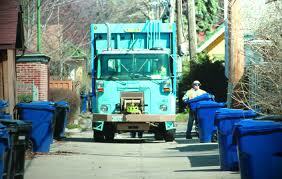 The use of designated recycling trucks avoids chances of contamination with regular garbage.